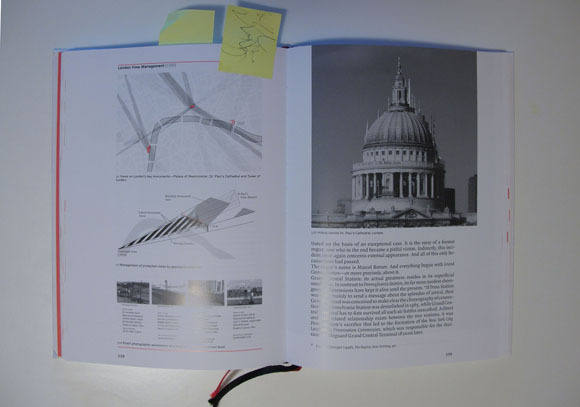 A book with a great question: what do we owe the planning and building rules? An for a change, this is a different approach to try and explain what the urban form, the urban morphology is and where it comes from. Traditionally, this seemed very easy, being simply the sum of all the individual buildings. becoming more complicated with for examples Kevin Lynch’s Image of the city were the idea settled that individuals perceive the city and this in turn influences how we understand and then obviously it became even more complicate with the introduction of the social dimension as a informing parameter of the built form, as for example in ‘the Social Logic of Space’. So it is complicated and the search for the identity of the place is going round and round. Going back, picking up a very pragmatic element and start rolling up the question from a completely different angle could be a very good idea. This is what I thought when I saw the book. Grand Urban Rules by Alex Lehnerer and published by 010 Publishers “is a tribute to the city’s will to form…”) as it says on the book back cover. The concept is then, nevertheless introduced using two aspects. One is to base it on the building rules or regulations exemplary taken from cities of central Europe and the United States with the exception of Vancouver and Hong Kong. The second aspect is then already the social connection with the statement “Setting standards is first and foremost a cultural act.” So we are back in the social business, but that is most likely a very good move. 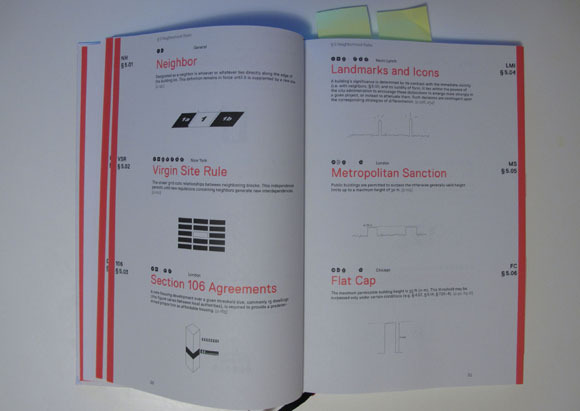 Image taken by urbanTick / Book spread with an overview of urban rules. The book might encounter a difficult problem, a certain resistance from readers to engage, specially from practitioners side. Very often the rules and standards are something that is seen as a negative force engaging in the creative process. This often creates the two sides of the planning an building process. On one hand the authority setting out the rules and on the other hand the planner or architect who has to ‘implement’ them. It often ends in a battle between the two. To some extend this is ok and part of the ongoing process of finding and defining the position of the current culture, to refer back to the statement on the book back cover. But too often this ends in useless, consuming debates. Refreshing then here, that this publication manages to completely avoid this topic and present, discuss and ‘implement’ regulations as a positive part of the planning process. As you start diving in to the publication and flip through the first 51 pages skimming all 115 examples chosen here you kind of forget about the battle and the misery it turns most debates into. Slowly but steadily a feeling creeps in to your mind, that actually this discussion is a lot larger than the battle between the parties of one building and the personal emotions involved and that it could actually be a cultural, society based discussion that authority and planner could lead and develop together. Having said that, the book is much more fun and not at all as heavy as my thoughts on this topic. It is actually fun and present the ideas and concept with a certain implicit humor that you will have a constant smile on your face as you read along, that it very rear with architecture, planning publications. It presents the ‘2h Shadow’ used in Zurich, Switzerland “A high-rise may not place a neighboring residential building in shadow for more than two hours per day.” and the ‘London View Management’ “Through the heights of the adjacent buildings, the upper space around the cathedral shall remain unencumbered by visual interference. Tall structures will be permitted to stand in the cathedral’s view shadow.” or the ‘5-Story Rule of Paris’ “Buildings cannot be taller than the height residents and users are prepared to climb using stairs. For buildings without elevators, this threshold has been reached at a height of five stories.” to name a few examples. Using these 115 examples the book then develops a clearly structured understanding of rules and regulations by comparing situations, implementations and outcome of different locations. For this it uses plenty of illustrative examples and makes beautiful use of illustrations. By the way the book is designed by Joost Grootens, who also did ‘the New Dutch Water Defence Line’. To sum up, this is a brilliant read and a book that could lead a new and much more open debate around the implications and possibilities of identity of the place. Lehnerer, A., 2008. Grand Urban Rules, Rotterdam: 010 Publishers.